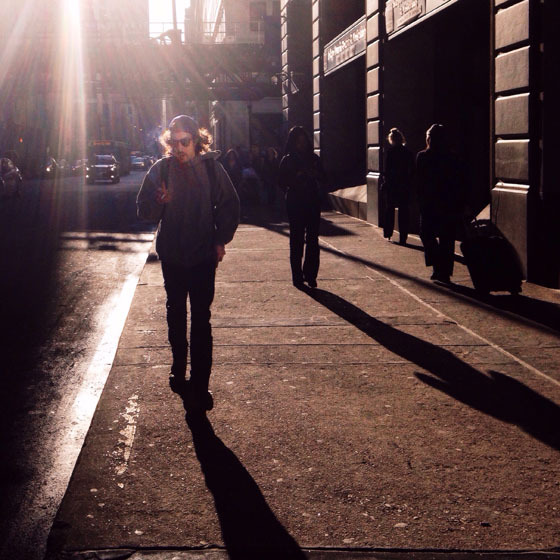 Street photography has become incredibly popular in the mobile photography community. 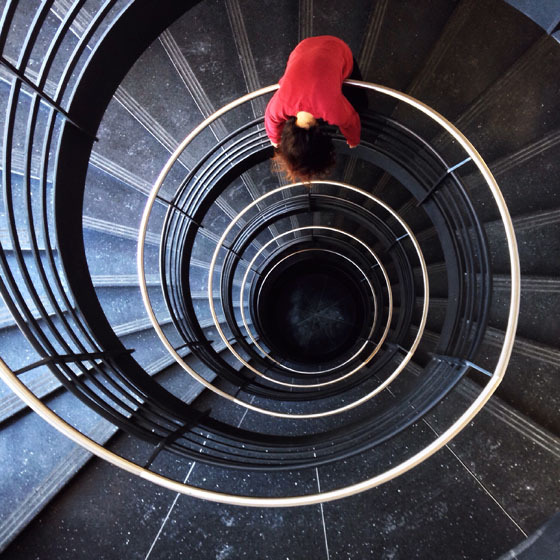 This genre of photography is all about narrating a compelling story of people’s daily lives, photographing interesting architecture, or often a combination of both. There are so many endless possibilities with street photography and it can be immensely rewarding, but capturing the hustle and bustle of city life can be difficult. 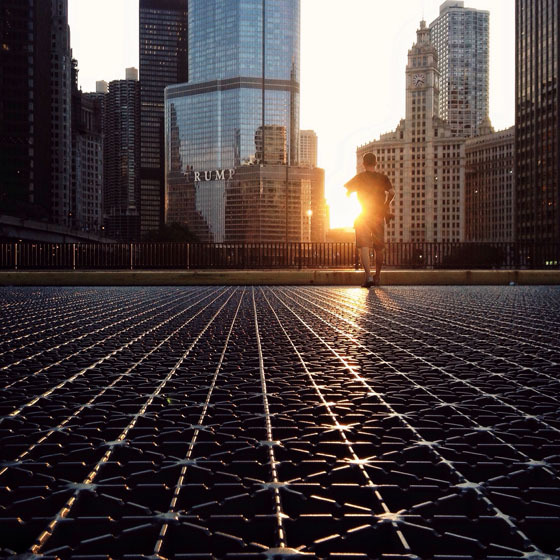 In this tutorial you’ll discover ten great tips for improving your iPhone street photography and telling interesting stories through your imagery. Street photography, especially with people involved, creates a unique moment in time that can usually never be repeated. Improving your street photography can be very rewarding, especially when there’s a purpose or a powerful story behind every photo taken. Our eyes are naturally drawn to lines and symmetry, which you’ll find all over towns and cities. Capturing an interesting subject in such a setting adds so much to aperfectly composed photograph, allowing you to create a visually appealing image that tells a story and evokes emotion in the viewer. 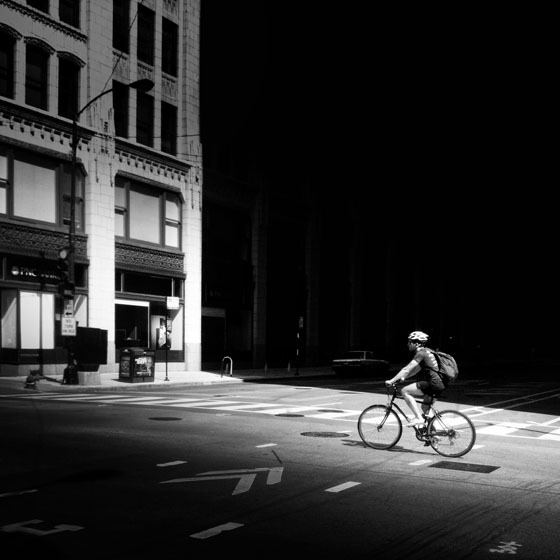 So, let’s take a look at ten tips that will help you to produce amazing street photography images with your iPhone. A good location is essential because it provides an interesting backdrop for your photo. Even though street scenes are often very busy, try to find a spot where there’s not too much distraction in the background. Being able to isolate your main subject from the background will make them stand out much better. Pay attention to the time of day when shooting. In some places, weekends are the best times to photograph locations that are typically busy during the week. Early mornings before rush hour are ideal for capturing quieter street scenes. Don’t forget to look for interesting objects in the foreground too. The white lines of this street crossing provide excellent foreground interest that add depth to the photo and draw the eye towards the main subject. Taking pictures of strangers can be a daunting prospect when you first start shooting street photography. But it’s the act of capturing the unique moments of people going about their daily lives that makes street photography so interesting. The iPhone actually makes it very easy to take photos of people without them noticing you. Its small size, and the fact that you can pretend you’re using it for something else such as listening to music or sending a text, makes the iPhone a very discreet camera. Shooting with the iPhone held in vertical portrait orientation will make it less obvious that you’re taking a photo. If you hold it in horizontal landscape orientation, this is probably an indication that you’re taking a photo which might ruin the moment once a stranger in close proximity finds out they’re being photographed. Try to blend into your surroundings so that people don’t take any notice of you. Standing in the middle of a road with your iPhone held out at arms length is going to get you noticed! This will result in you being unlikely to get natural shots of people in the street. Another way to remain discreet is by pretending to be tying a shoe lace, andtaking your photo from a low angle. 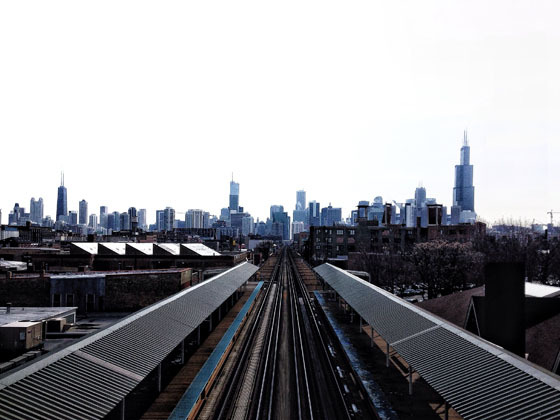 Great places to photograph strangers are during a train commute, stoplight intersections, coffee shops, or loading zones for taxis and buses. 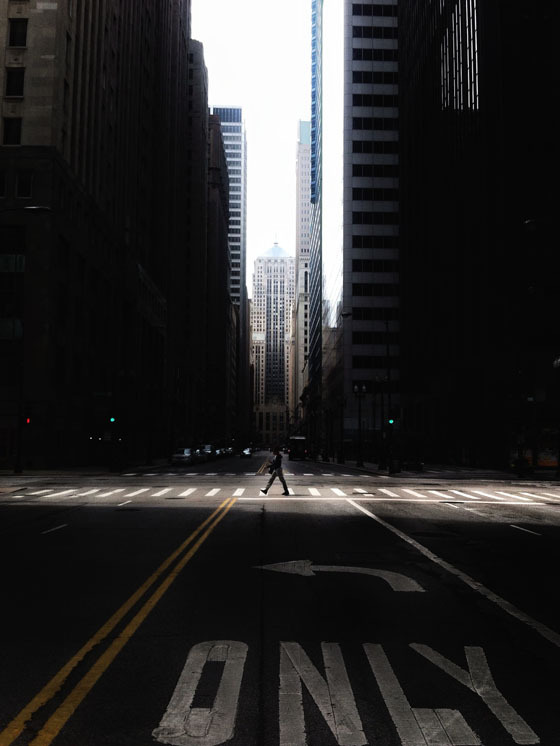 If you’re at an intersection, strangers will probably be more focused on watching for the green light or crossing the street, rather than paying attention to a photographer. Capturing action shots of moving subjects can be difficult. There’s the possibility of blurred images due to unsteady hands or the fast movement of subjects, and often the subject has disappeared by the time you’ve pressed the shutter button. Anticipating the shot and using burst mode is really important when photographing moving subjects such as people walking down the street or moving traffic. Using burst mode ensures that the perfect moment is captured, such as a person in full stride or with an interesting facial expression. The native camera on the iPhone 5s, 6, and 6 plus has a burst mode option. TheCamera+ app also has a burst mode feature which is a great asset for all iPhones. To activate burst mode simply hold down the shutter button and your phone will take a series of shots. You can then choose the best photo from the sequence. 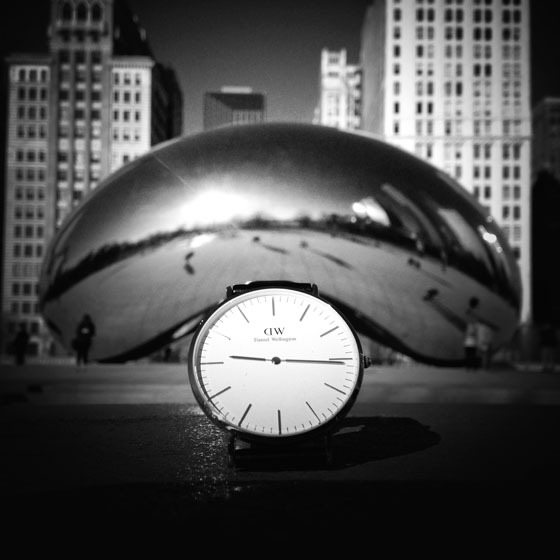 Make sure HDR mode is off when capturing motion shots since it can add blur to your images. Every second counts when photographing motion, so try to anticipate the movement of your subject and start shooting in burst mode just before they enter the part of the frame that you want to capture them in. This will ensure that you never miss the perfect shot. Street photography isn’t all about photographing people. Towns and cities are full ofinteresting buildings which can make great photographs on their own. 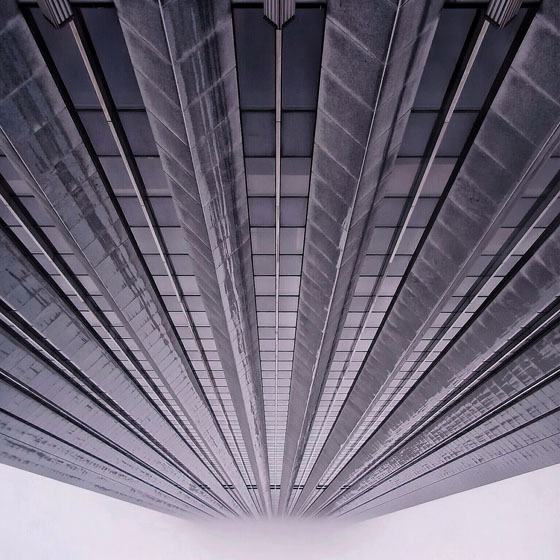 You could capture the whole building, an entire city skyline, or just part of a building to create a more abstract shot. Photograph them from the outside and the inside, trying out different angles to create unique compositions or symmetry. Using leading lines will help you to create very strong compositions that draw the eye into the image. 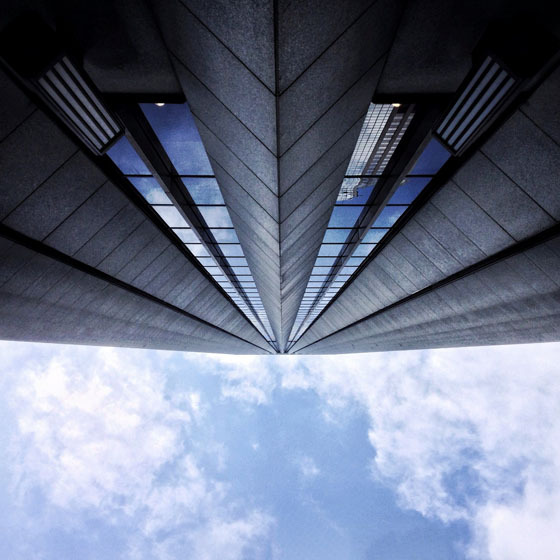 Photographing buildings from an interesting angle, such as this shot looking straight up towards the sky creates a more unique image than shooting it from straight on. Don’t just walk around photographing the obvious subjects at eye level. Look up to see what’s above you, then create interesting look-up shots of buildings, bridges,trees, etc. 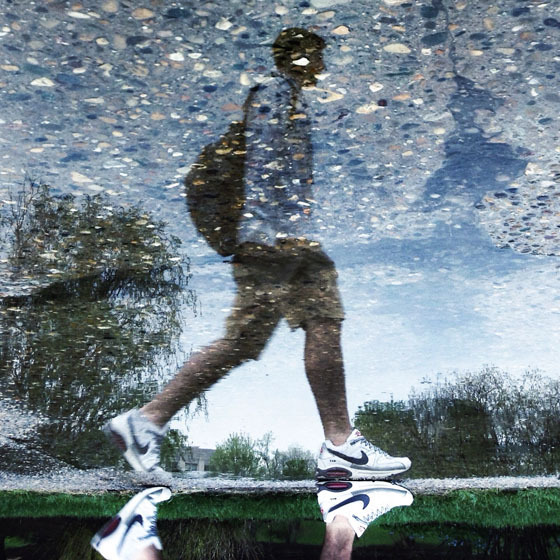 Move around and try out different angles while looking at the iPhone screen to capture a unique look-up perspective. Try placing your phone against a building and shooting straight up towards the sky. You can create amazing symmetrical shots using this technique, and if the building has a lot of glass you might be able to capture some great reflections too. As well as looking up, pay attention to what’s beneath you. Look down at the ground to see what interesting shots you might get, such as cracks in the pavement, discarded objects, etc. 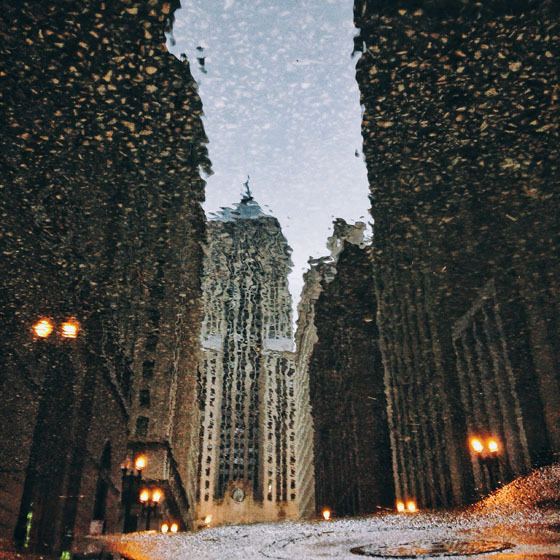 Pay attention to puddle reflections and other shiny surfaces as you can capture stunning reflections of buildings and people in these reflective surfaces. Crouch down low and experiment with the shooting angle until you get the perfect reflection in your composition. For a more intriguing approach, try flipping your image upside down in post-processing. Alternatively, shoot from high up to get a bird’s eye view of the scene. Try standing on a bridge or the balcony of a tall building and shooting straight down on a busy street scene. Stairwells also make great locations for this kind of shot. Try to be creative when shooting stairwell photos. Adding a person as a subject might help create a more unique shot with a strong focal point. Street photography isn’t all about capturing wide angle street scenes. To add variety to your shots, try getting up close to your subject and capturing small details with your camera. These small details can also tell a story. How about taking a close-up shot of the texture of peeling paint on an old building, or the umbrella of a person walking in the rain? Focusing up close on an object in the foreground is a great way of creating a shallow depth of field and blurring out the background. By focusing on my wristwatch in the foreground of this photo, the background has been thrown out of focus. You can still make out the scene in the distance, but it creates a more unique shot of this famous landmark. 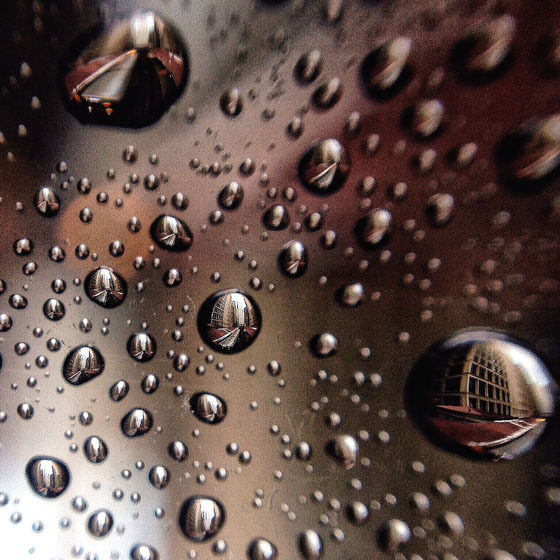 Another interesting technique you can try out is to capture a close-up photo of raindrops on a shiny surface with a reflection in the droplets. If you have a macro lens for your iPhone, try using this lens on a window with water drops. Such a close-up view will enhance the reflections within the water droplets. If you look carefully, you’ll notice that the reflections are inverted in the droplets. You don’t necessarily need rain to create water droplets. You could use a tiny water spray and a plastic CD cover to produce your own water droplets. When used with the right street backdrop, a powerful image can be produced. 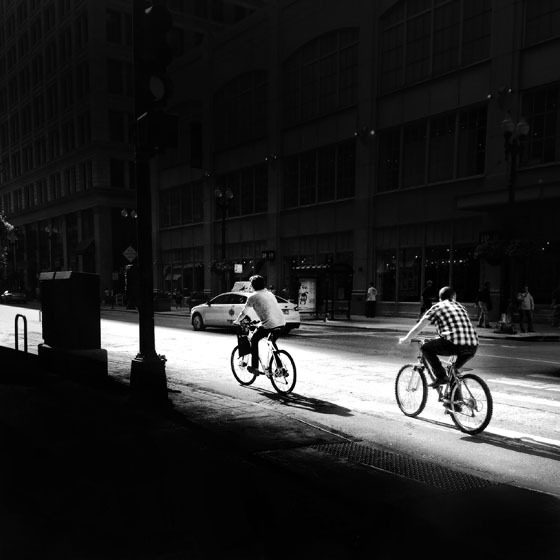 The time of day and the type of light that you shoot in can make a big difference to how your street photos turn out. Shooting when the sun is low in the sky, during the golden hours around sunrise and sunset, is often the best time of day to capture photos. This kind of light creates a lovely warm glow in your images. Golden hour is also the perfect time for capturing stunning silhouettes where your subject appears as a dark outline against the bright sun. At this time of day you’ll also notice long shadows created by the low sun. These long shadows will add interest and drama to your street photos, creating powerful compositions with a sense of mystery. Using long shadows in the foreground of your photo is a great way of adding foreground interest and leading your eye into the image. An alternative approach to shooting at golden hour is to try shooting in harsh sunlightaround the hours of midday. We’re often taught that photographing in sunny conditions will ruin your photos, but if you get it right you can create some incredibly dramatic shots. This kind of light creates harsh shadows and lots of contrast in the scene which can add drama and mystery to the shot. Urban “canyons” provide the best conditions for harsh light. 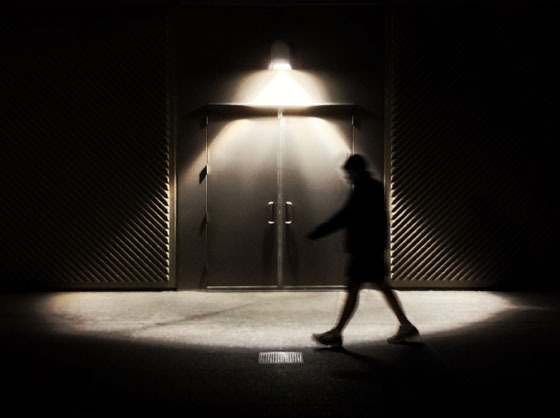 Look for locations that have areas of bright light and dark shadows. Buildings are great for casting large shadows over a scene. These kinds of photos often look great in black and white as this accentuates the contrast between the light and shade. 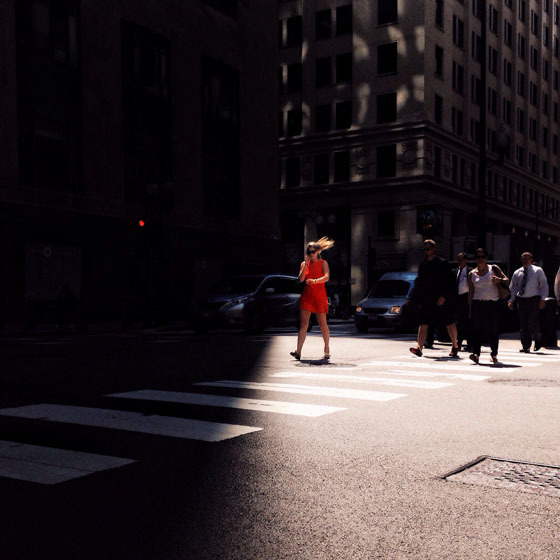 Under-exposing your photo is the best way to create the most dramatic light and shadow-play street photos. Lastly, instead of only shooting when the sun is shining, always remember to take advantage of bad weather. 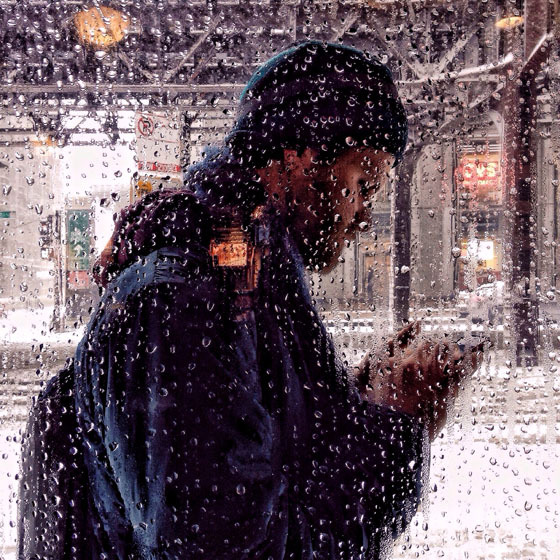 Snow, rain and fog provide all sorts of gifts for the street photographer. 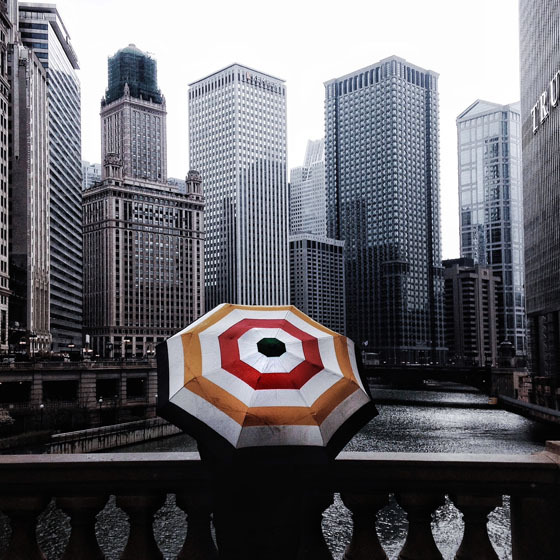 On a rainy day, you’ll find an abundance of umbrellas which make great additions to your photos. They add a splash of color and a strong geometric shape to your images. Water droplets, reflections, and textures on wet roads are also powerful elements that can add to the final image. One of my favorite techniques is to take advantage of little water droplet formations on glass panes at bus stops or coffee shops on a rainy day. 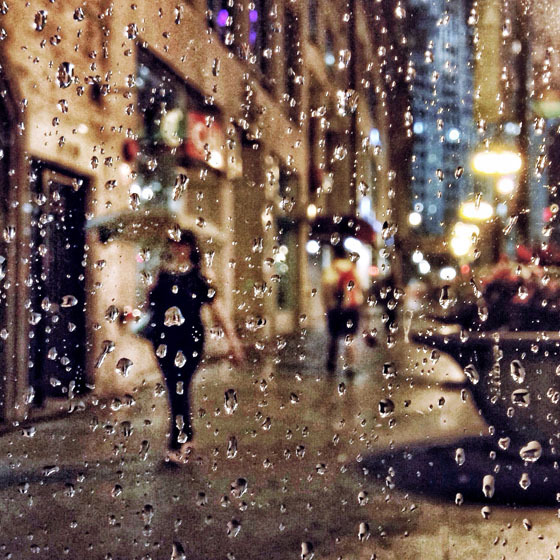 Shooting strangers through the droplets can lead to incredible abstract-style street photos. 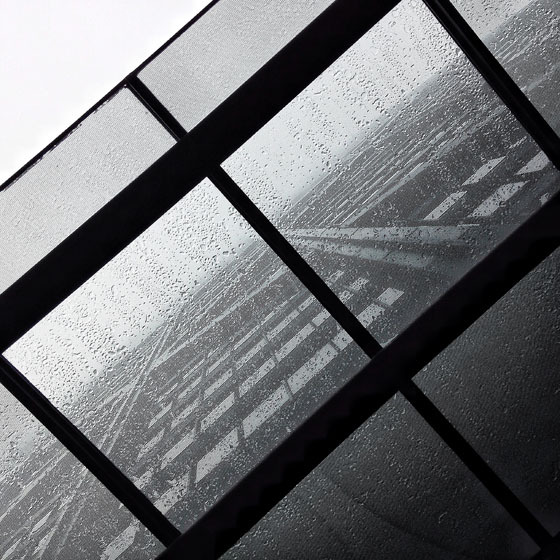 Make sure you set focus on the raindrops so that the scene outside appears blurred. 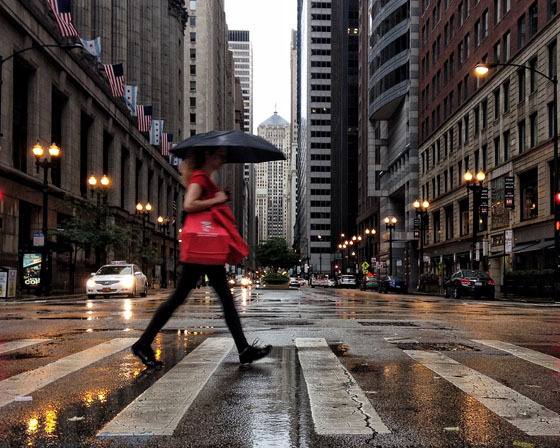 Wait for a person (especially with an umbrella) to walk by and take a few shots with burst mode. Fog is great for isolating your subject as it provides a plain white backdrop in a scene that would normally have a busy background. 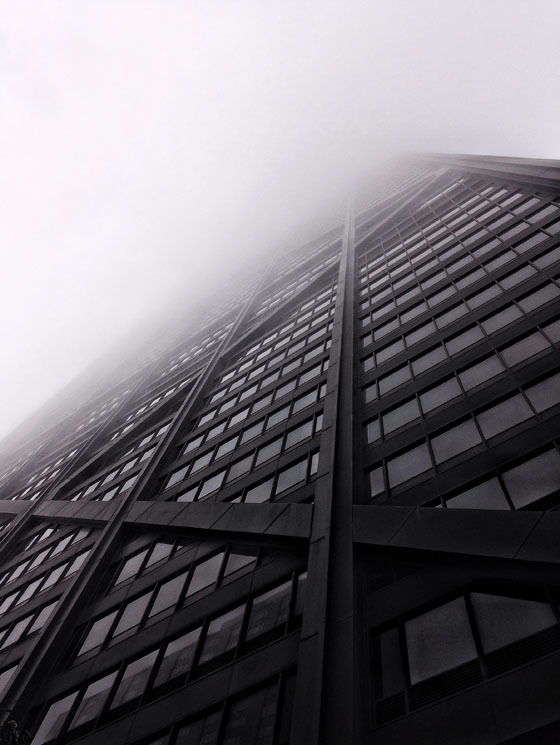 You can also create powerful images by taking look-up shots of tall buildings that disappear into the low fog. 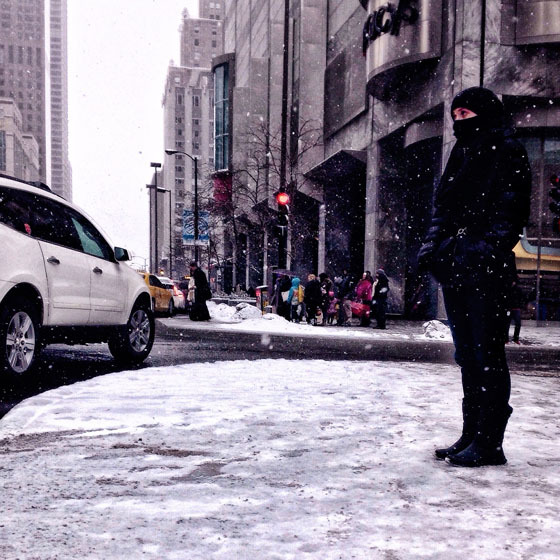 Snow also creates an interesting environment for street photography. It adds brightness to the scene and you’ll find people behaving differently in snowy conditions. Try using the flash to capture falling snowflakes – the bright light can help to pick up the details. So wrap up warm and dry, and venture out into the city in bad weather. 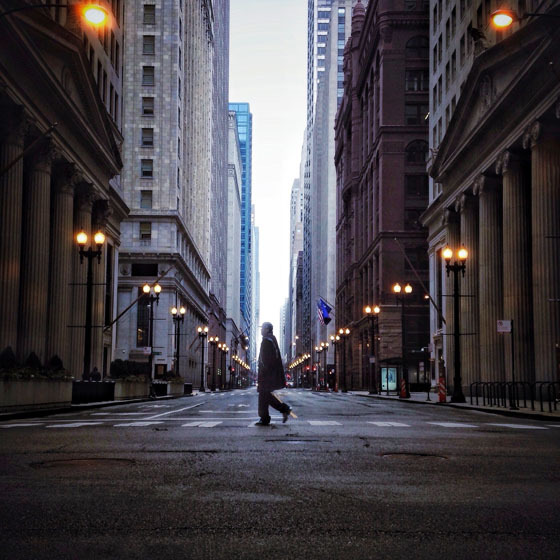 I guarantee you’ll find some great street scenes to capture with your iPhone! If you also want to take incredible photos with your iPhone, please join 138,712 subscribers who receive our free iPhone photography email tips that you won’t find anywhere on this website. Next How can I help you ?